The Tactical Drop Leg Holster offers the versatility of a modular platform which can utilize existing IMI holsters and pouches. The polymer main panel offers breathability and conformability to the users upper leg dimension. Fully adjustable straps fitted with ITW-Nexus revolutionary side release buckles make the holster comfortable and fully adjustable to the operator. Holsters and equipment pouches can be removed and installed while being worn due to IMI's unique mounting system. Available color for IMI-Z2200: Black, OD Green, Desert Tan. IMI Defense was established with one mission: design, manufacture, and supply the highest-quality and most innovative firearm products and accessories to the military, law enforcement, and civilian communities. Ground-breaking polymer holsters and polymer magazine pouches are hallmarks of the IMI Defense line of products. All items are made and packed in a non smoking environment! The item "IMI OD Green Tactical Drop Leg Holster use by IDF fits all IMI holsters" is in sale since Monday, June 2, 2014. 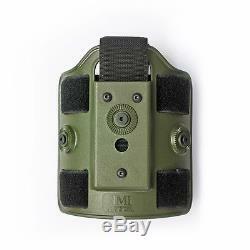 This item is in the category "Sporting Goods\Hunting\Holsters, Belts & Pouches\Holsters". The seller is "yaron_il" and is located in petach-tikva. This item can be shipped worldwide.